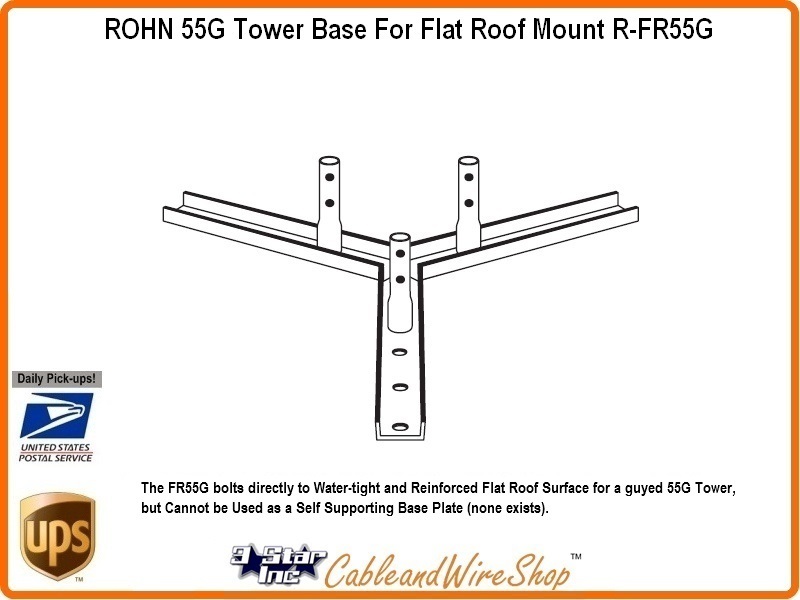 The FR55G bolts directly to Watetight and Reinforced Flat Roof Surface for a guyed 55G Tower, but Cannot be Used as a Self-Supporting Base Plate (none exists). This Tower Base uses double bolted joints which are proven to be the best method of joining tower sections for sturdiness and dependability. The 55G tower can be used guyed, self-supporting or bracketed configurations according to specifications in the ROHN catalog. As a guyed structure, it can rise to a maximum of 400 feet. However, Roof Mounted Tower Options may limit Potential Height considerably. Self-supporting and bracketed heights depend on loading and are also specified in the ROHN catalog (see Footer below).